1 Publications by "S. Grauer-Gray"
This paper describes an efficient CUDA-based GPU implementation of the belief propagation algorithm that can be used to speed up stereo image processing and motion tracking calculations without loss of accuracy. 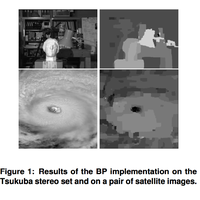 Preliminary results in using belief propagation to an- alyze satellite images of Hurricane Luis for real-time cloud structure and tracking are promising with speed- ups of nearly a factor of five. S. Grauer-Gray, C. Kambhamettu, and K. Palaniappan. GPU implementation of belief propagation using CUDA for cloud tracking and reconstruction. 5th IAPR Workshop on Pattern Recognition in Remote Sensing (ICPR), pages 1--4, 2008.